Hosting 35 cooperators from 9 different countries (Italy, Belgium, Bulgaria, Czech Republic, Poland, United Kingdom, United States, Japan, Sri Lanka) with a focus on communication, social farming and management, the 2017 edition confirmed the International School as a unique place of dialogue and mutual learning. 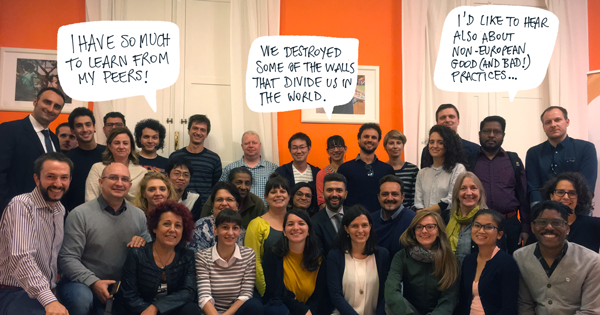 Cooperators from UK, Italy and Spain shared their experience and eminent speakers from European and International Institutions debated around the topic of technological changes and how to support the development of social cooperatives worldwide. In particular, the School could count on the participation of Ulla Engelmann, Head of Unit for Clusters, Social Economy and Entrepreneurship within DG GROW (European Commission) and Simel Esim, Head of the Cooperatives Unit at the International Labor Organization. Alessandro Martemucci, CEO of Officinae Agency, and author of the book Marketing Low Cost and founder of the web portal marketinglowcost.it, animated the first session on how to communicate about social cooperatives where participants could learn model and strategies for enhancing communication effectiveness through building the cooperative identity, promoting the added value in production of good and services, branding strategies and marketing communication. In occasion of the study visit, participants have visited a social farm Fiori di Zucca. Social farming is in Italy an emerging sector where social cooperatives promote new forms of work inclusion, social services, education activities and therapy, while providing social services and assistance to people living in rural areas. During the seminar “Work, sharing economy, platforms – towards a cooperative approach?” representatives from the Italian government, the International Labour organisation, the English worker-owned co-operative Outlandish and the Italian CoopUP network shared their view and experience on social cooperatives contribution to face the ongoing societal changes through work inclusion and fighting social marginality and inequalities and whether technology can enhance their impact. In the last session, the Integrated Social Services Group presented its experience with the participants. Created in Bilbao in 1986, the SSI is a cooperative whose aim is to respond to the social needs of people in situation of dependence or social vulnerability. In particular, the organisation has focused its development on the promotion of its female professionals, who, in most cases, come from difficult situations or suffer from socio-familiar difficulties.